Posted by Jenny in hiking, winter hiking. Looking west from Blackrock summit. 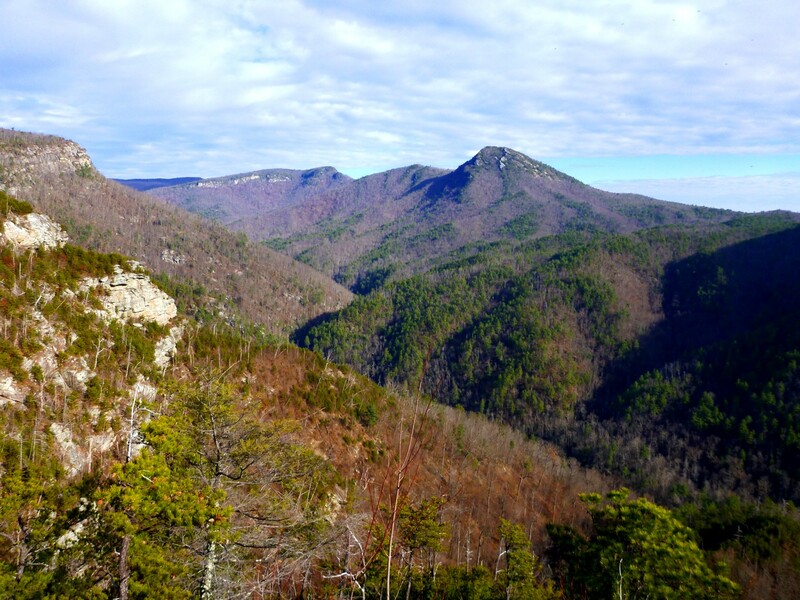 The conical peak is Perry Top on the Fisher-Dicks Creek divide. 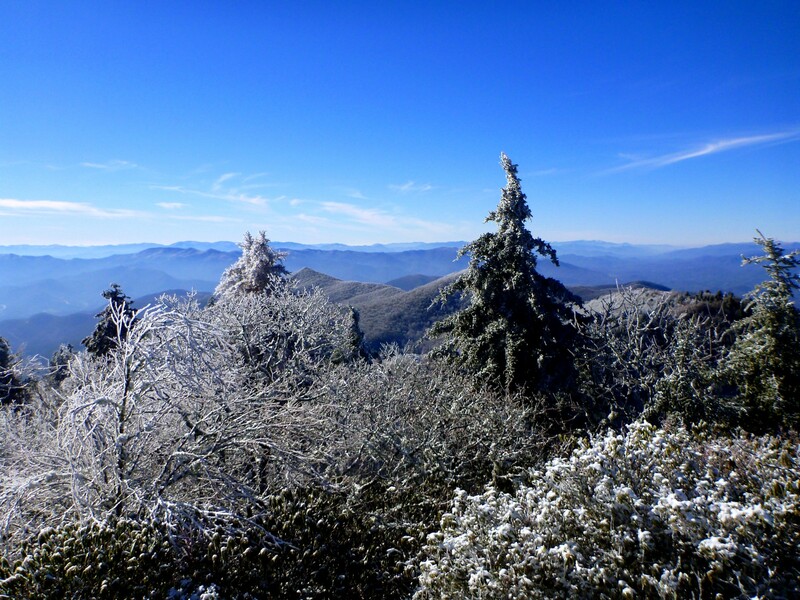 As I made the short drive from my home toward the imposing wall of the Plott Balsams, I saw that the frost line in the trees was around 4500′. 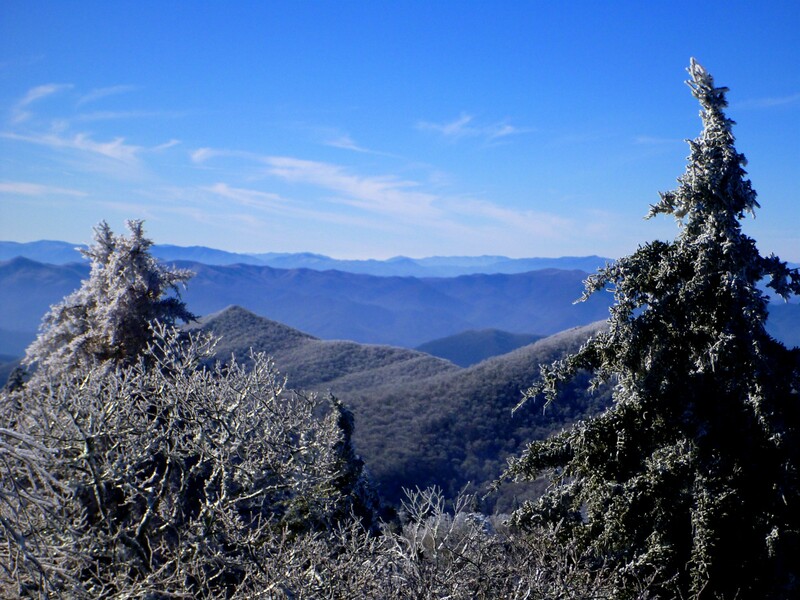 The spruces and balsams on the ridgetop had a ghostly look from a distance—they looked even more ghostly when I finally got up among them. I headed up via my standard cold-weather route. It would be my route all year round if it wasn’t for the thriving poison ivy that’s a real problem for me when it gets knee-high. 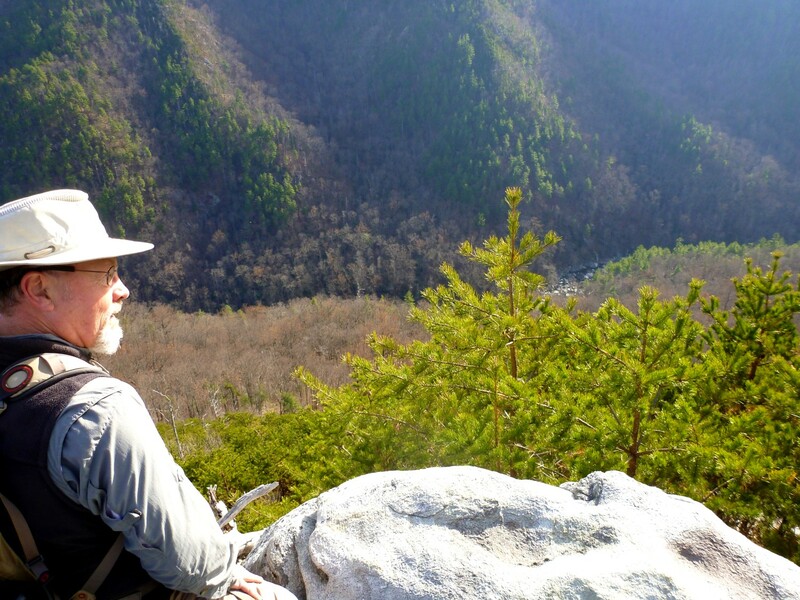 I follow an unmaintained trail from close to the trailhead and make a short bushwhack connection to the East Fork trail, hitting it where it enters the ravine of the stream. 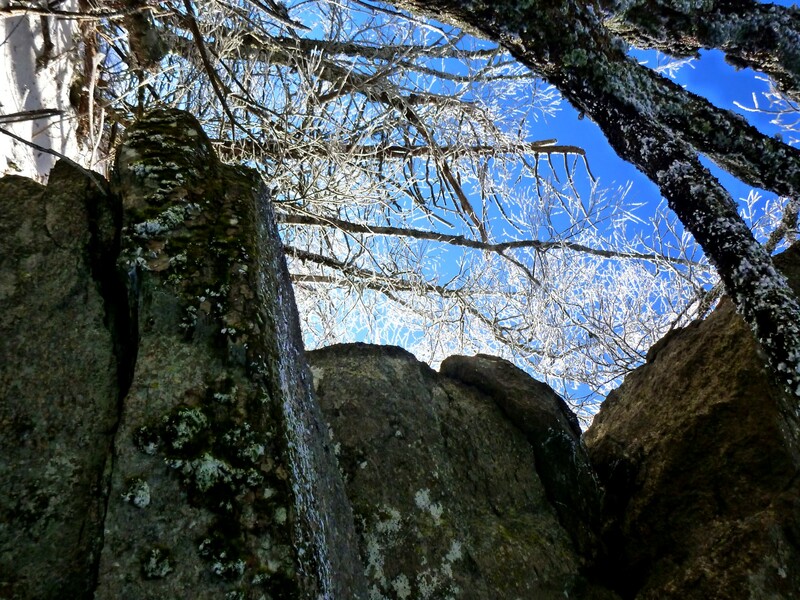 I encountered a thin layer of slushy snow as I climbed up past the invisible waterfall. 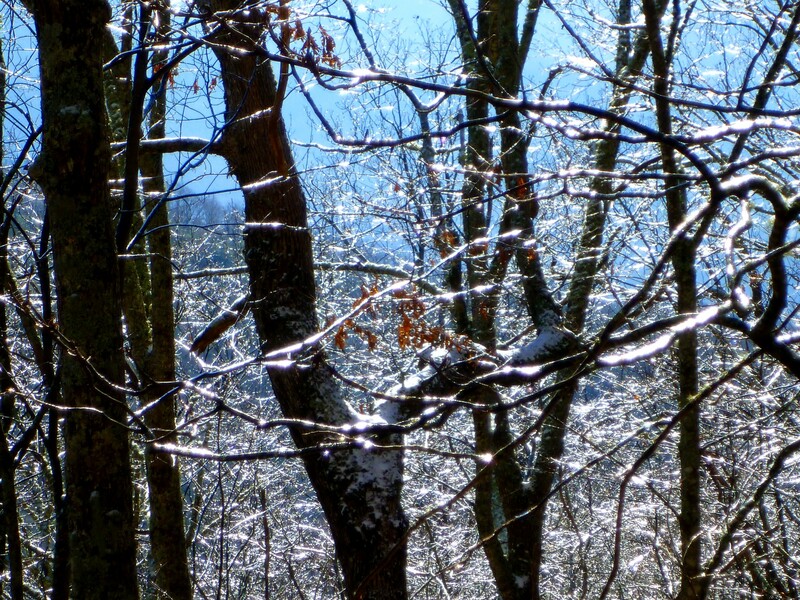 Eventually I got into a world of glazed branches, sparkling beautifully in the sun. 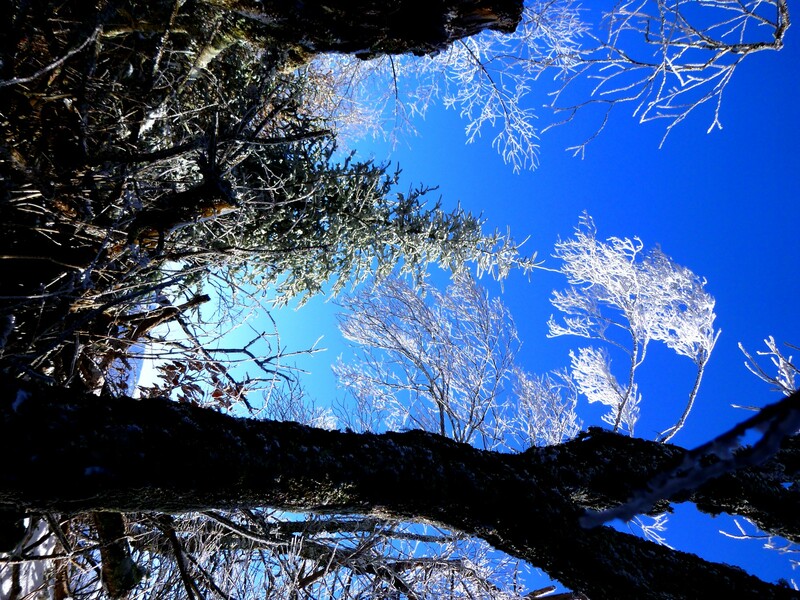 A magic wand of ice had been waved over the forest. 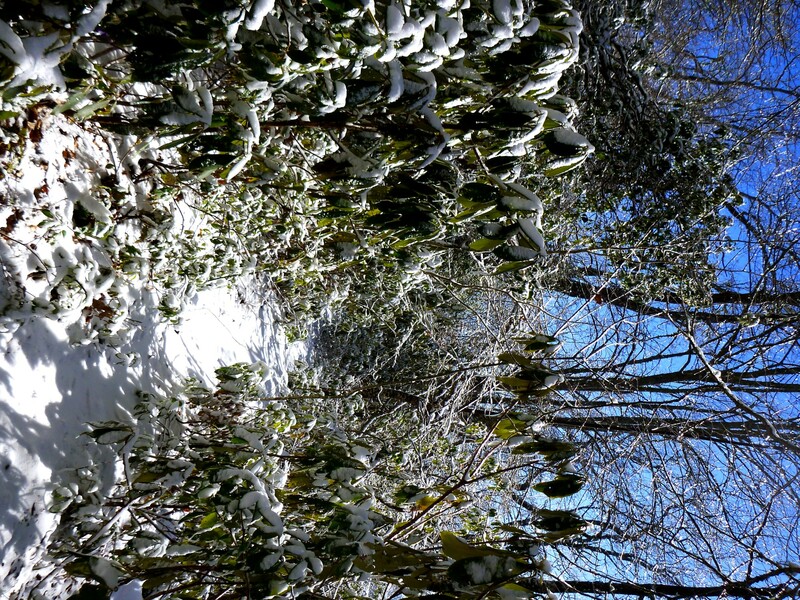 Snow started to cover the branches, making the rhodo droop over the trail. It started to look wintry. I reached my favorite lunch spot at 4900′. It is a flat cleared area, obviously used for camping although there is no water nearby. 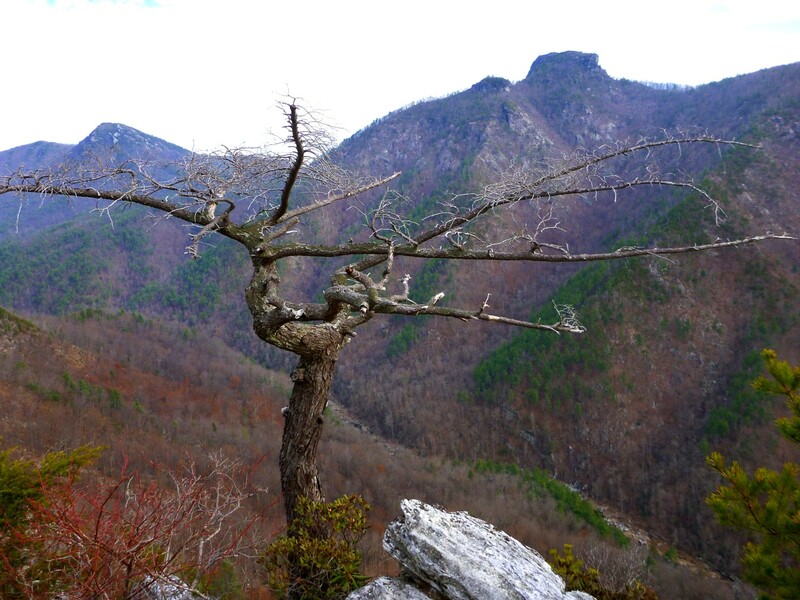 It looks down into the West Fork valley toward Pinnacle Bald and The Pinnacle, but views are very limited in the summer. I don’t know what the story is behind this clearing—maybe it originated in the logging days and has been kept cleared—but it has a really odd mix of vegetation. You see junipers, a few spruce, Table Mountain pines, and lots of oaks. When the ground is clear of snow, you see a tiny bright pink lichen growing here and there amidst the mica-sparkling gravel. Carpets of club moss stand next to a patch of invasive Scotch broom, which is a real plague in southern Jackson County. 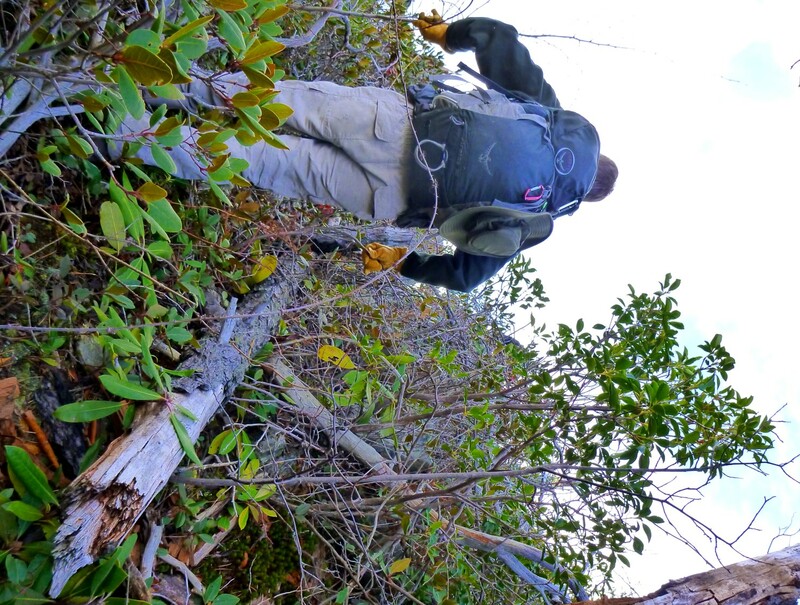 The other side of the trail features a nifty three-tiered mix of rhodo growing under oaks and laurel under rhodo. There’s something I like about the small leaves on the bottom, and then large leaves, then upright trunks. Hard to explain! 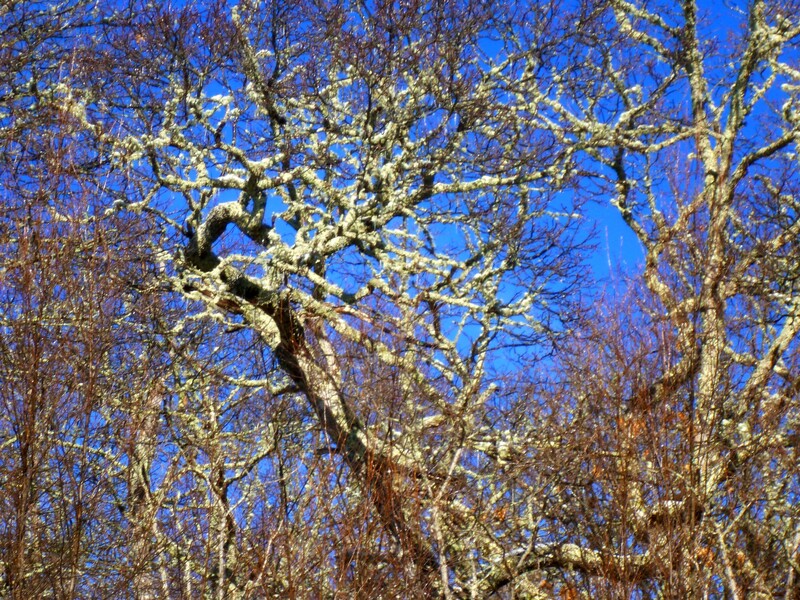 The oaks are all covered with gray-green lichen from the moist cool air up there near 5000′. After having my peanut butter sandwich, I headed on along the old roadway that contours east, then turned for the steep climb up to the crest. I put on my microspikes here but found that even up on the heights the temps close to the freezing point made for annoying clumps of snow and leaves that stuck to my spikes. I’d stop every now and then and stamp my feet to get rid of the accumulation, but kept the spikes on because I was convinced that soon I’d get into solid subfreezing temps. It finally happened on the upper ridge. 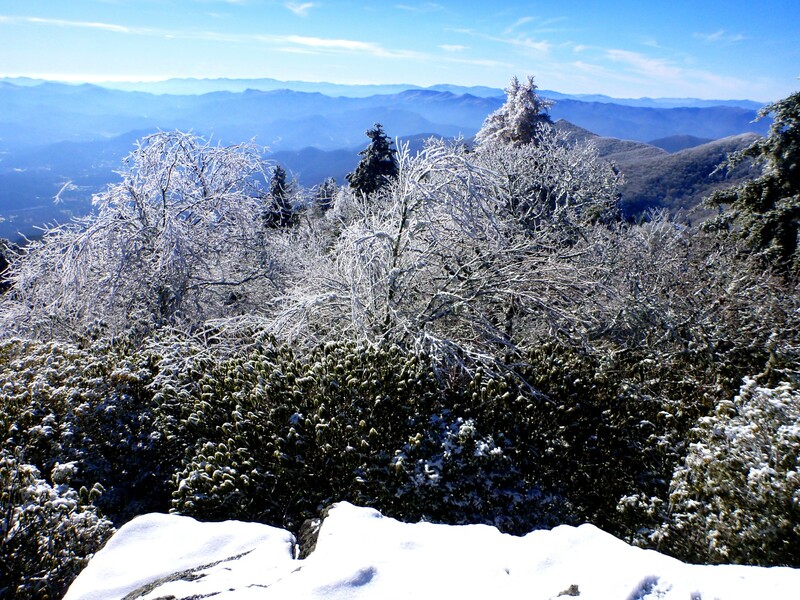 And I was glad I had the spikes up there on the craggy ridgetop. I could see that a period of freezing rain had preceded the snow even up that high. 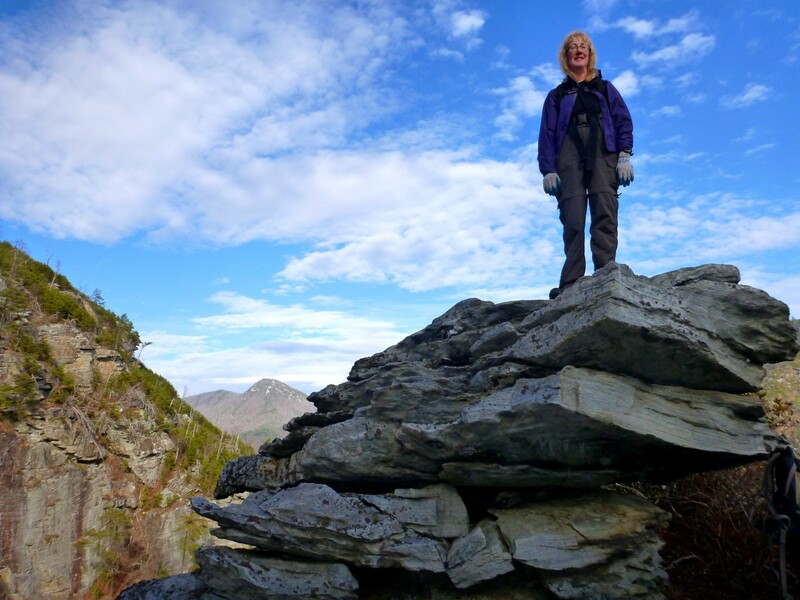 I made my way around the little fortress of rocks that I mistook for the summit the first time I came up here and scrambled over the steep little ups and downs toward the true high point. At one spot I took a fairly good slide even with the spikes. I emerged onto the summit block of Blackrock. 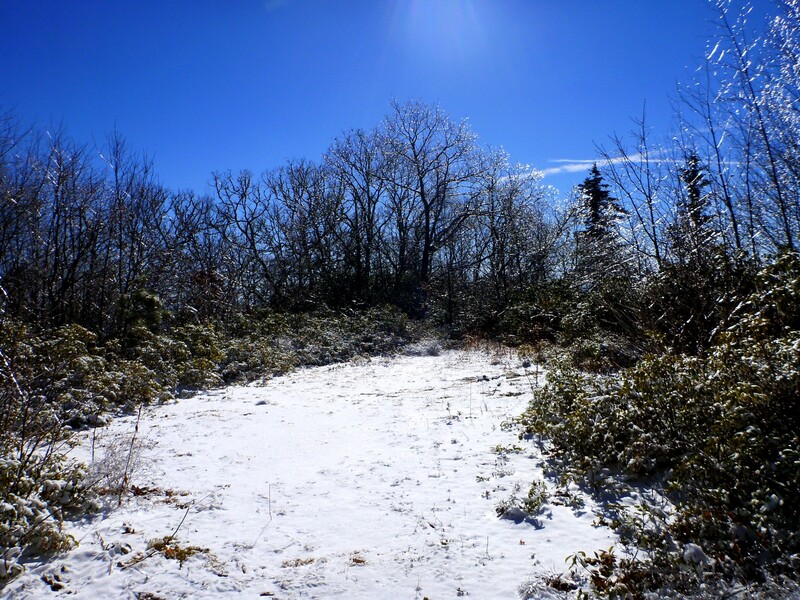 It was so neatly blanketed in its cap of snow that I was almost sorry to mess up the sparkling white with my footsteps, but I clambered up on top and marveled in the views on a crystal-clear day. 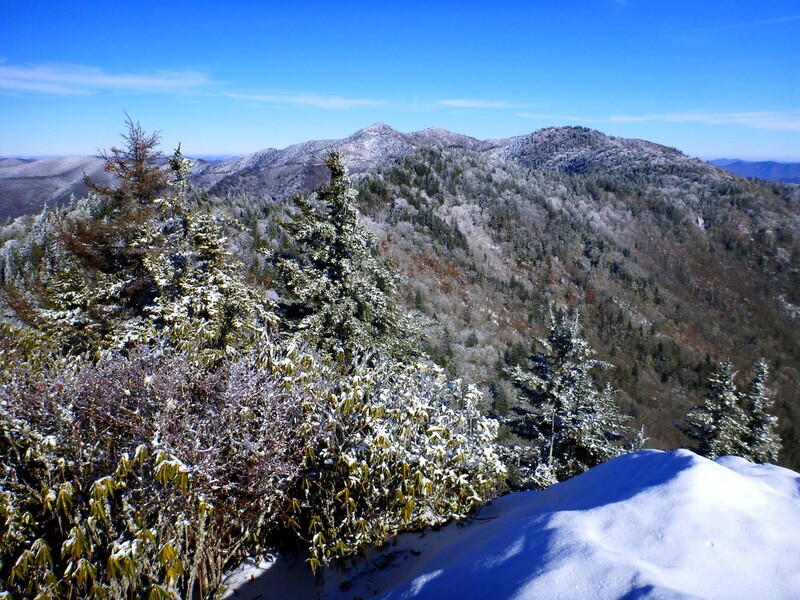 View toward Yellowface and Waterrock Knob. The Parkway is closed (maybe for the season), and so no one had made the trip out from Waterrock along the crest. And I could see from the lack of footprints that no one else had climbed Blackrock or gone anywhere other than The Pinnacle, that rock nubbin that’s a popular destination. Coming back down, I took off the spikes as soon as I got back to the freezing line, figuring the clumping would just make it harder to keep my footing on that steep slope of snow over slippery oak leaves. It was a bit tedious, but I made it back to the roadway and decided to go back down via the West Fork. I sort of wish I hadn’t. I kept running into people who asked me if I’d been to “the top,” or how far it was to “the top,” and they meant The Pinnacle. I didn’t bother explaining that I hadn’t been to that “top,” just the one 1000′ higher that not so many people go to in the winter. 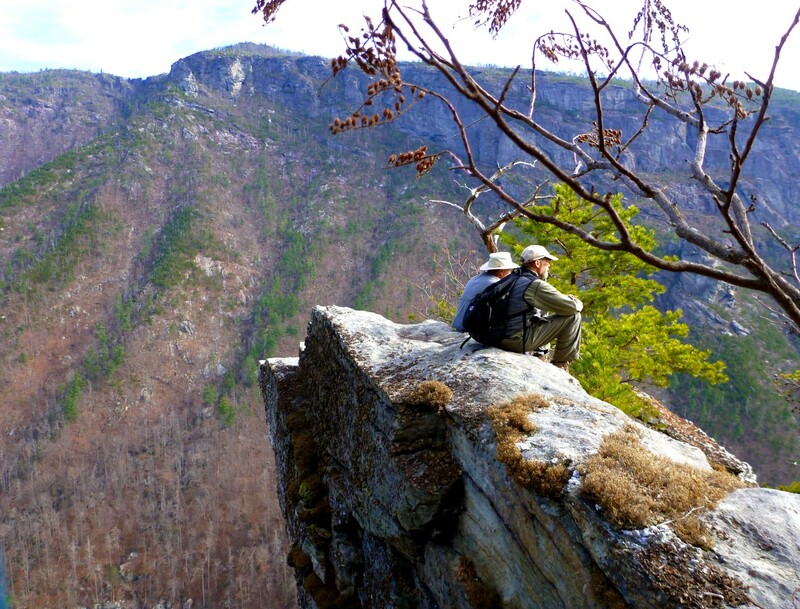 Posted by Jenny in bushwhacking, hiking, Linville Gorge. Lower Original Scramblers’ Trail—LOST. What a great way to spend a day. 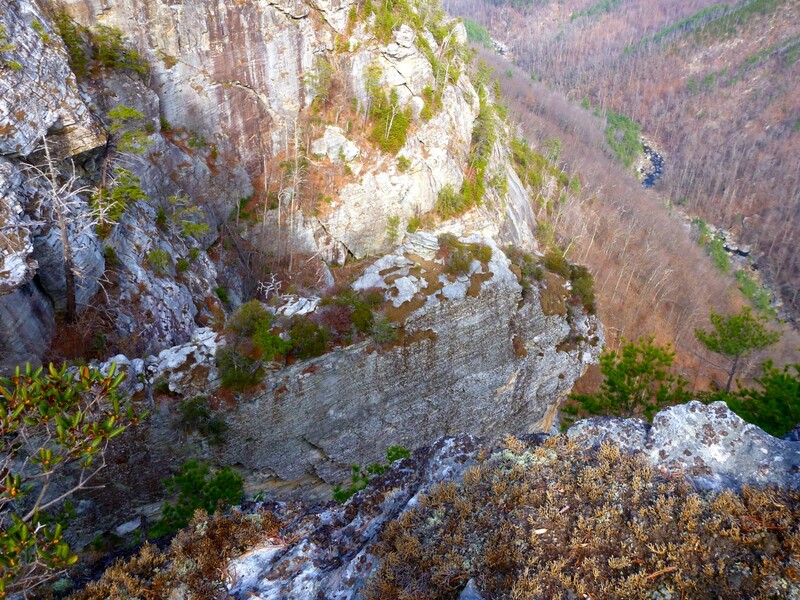 Here’s the story behind the name: When the Rockjock trail was first blazed along the western rim of Linville Gorge, it touched the most dramatic points between Wiseman’s View and the Pinch-In trail. 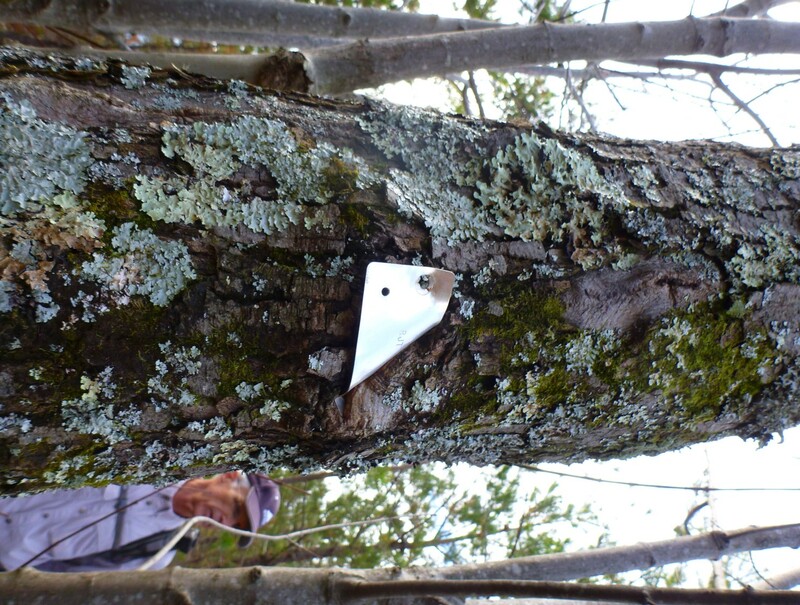 But fires in the gorge area, plus destruction of the forest by the pine bark beetle, damaged Rockjock. A severe fire in 2007 completed the obliteration. Over the following years the trail was rebuilt—but not exactly where it had been before. As I understand it, Forest Service influence resulted in a big piece of it being made straighter and safer at the cost of bypassing its more “interesting” sections (read “difficult” or “precarious”). LOST consists of very faint paths that travel along or out to those super-fun spots on the brink of the rim that have a precipitous dropoff. 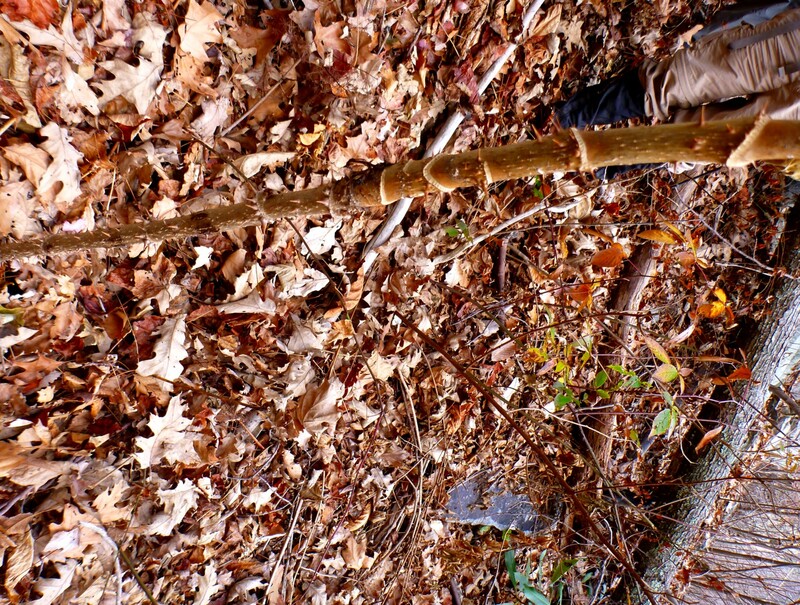 Much of LOST is, well, just about lost in the brush and the blowdowns. Our outing yesterday was masterminded by Marshall Weatherman. He and the others of my companions are members of the Piedmont Hiking and Outing Club, but this was not an official club outing. The others were Dale Dagenbach (he and I both went to New College), Gary Johnson, Jim Plant, and Will Truslow. 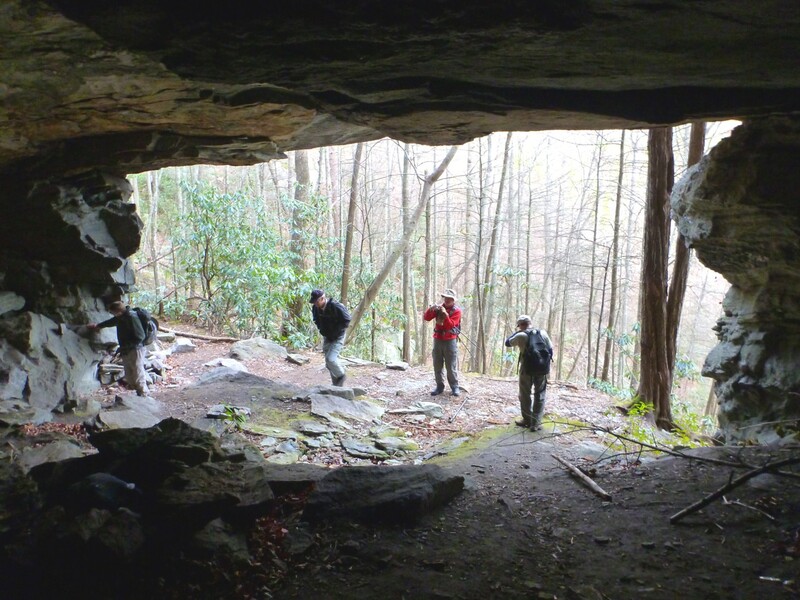 When I found out about this hike, I seized the opportunity to go along with people who are really knowledgeable about this area. It would be tough or impossible to do this without a guide. We left my car at the Pinch-In trailhead on the Kistler Memorial Highway, which is not really a highway but a dirt road that features atrocious washboarding, especially on the hills. 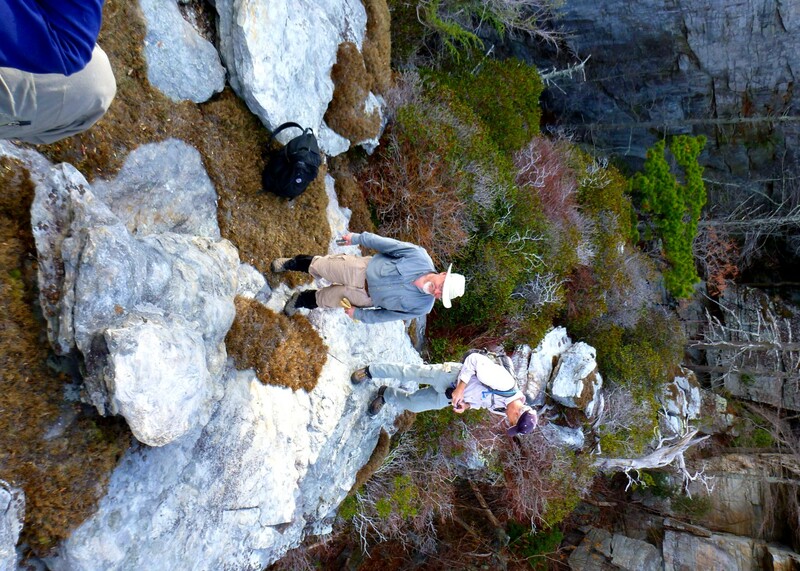 Then we drove to the Conley Cove trailhead and started by descending that trail past the junction with the “new, improved” Rockjock. 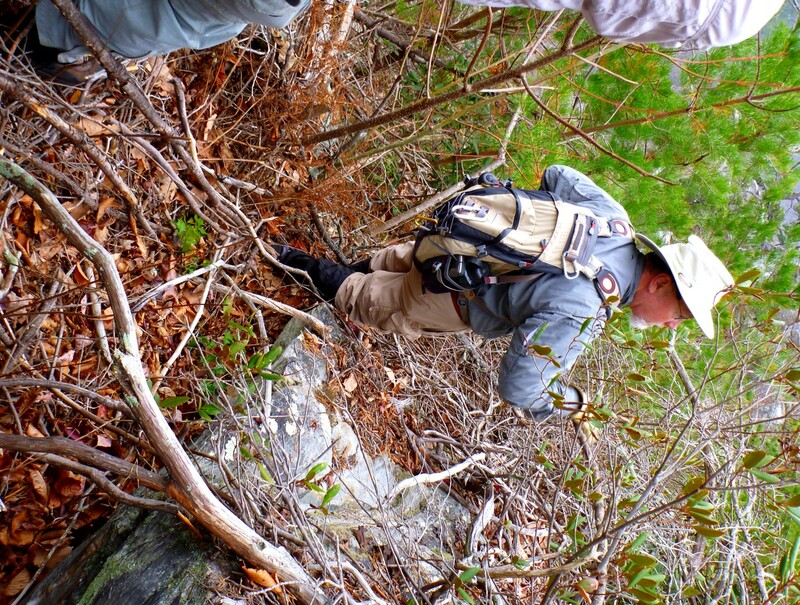 We soon left the trail to scramble down to Conley Cave. 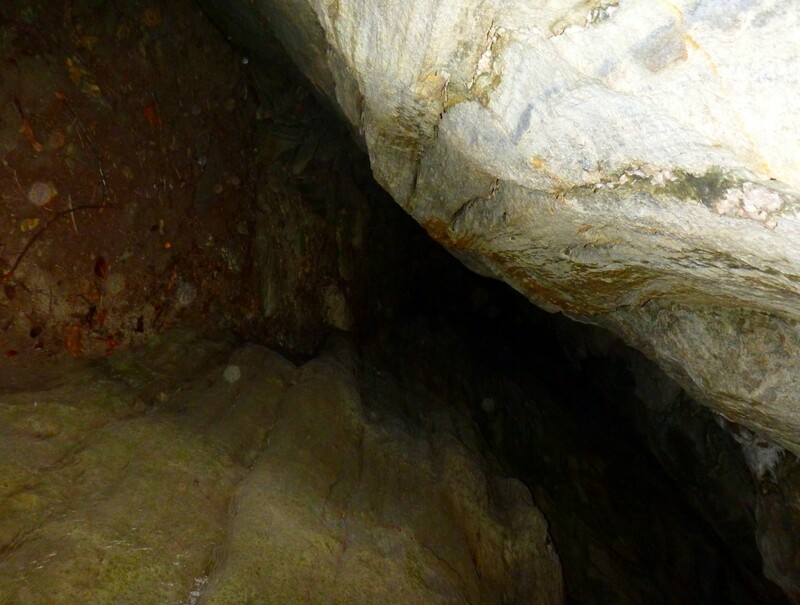 The cave is quite large with a beautiful flat roof. 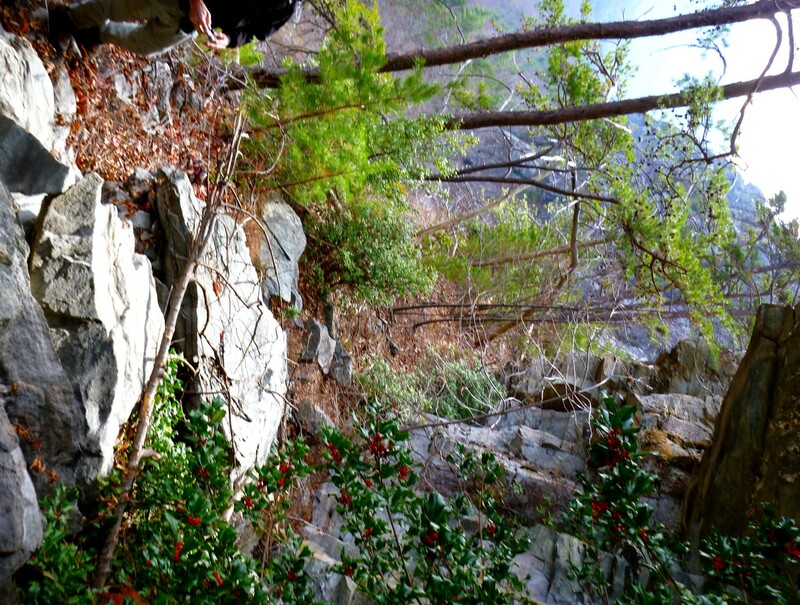 We climbed up a steep rock crack near the cave and waded through some brush. Lots of this kind of going. We made our first visit to the rim. We climbed up to the Rockjock trail. Where we reached it, LOST had not yet diverged from the official pathway. Markers such as you see below were put in place years ago by Bob Underwood, the guru of Rockjock (and more recently of LOST). The names he gave to the notable points reveal a sense of whimsy. One of the original metal trail markers. It has the initials “RJT” on it. 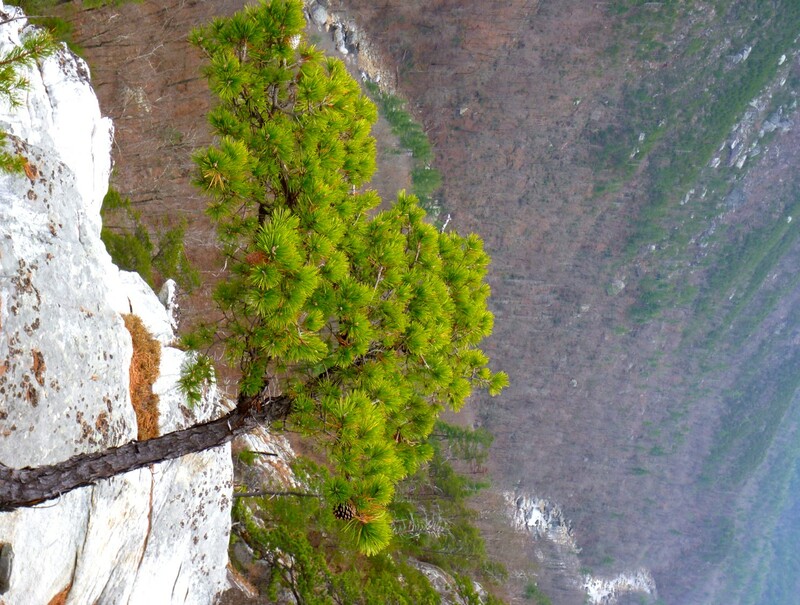 This was a pitch pine or Table Mountain pine. Marshall wears his GPS on his shoulder, attached with velcro and a lanyard. Dead pine at Hackers Point. Table Rock across the gorge. I’ve seen photos of the tree above when it was alive not that long ago. It was beautiful, like something in a Japanese brush painting. It still has a wonderful shape. 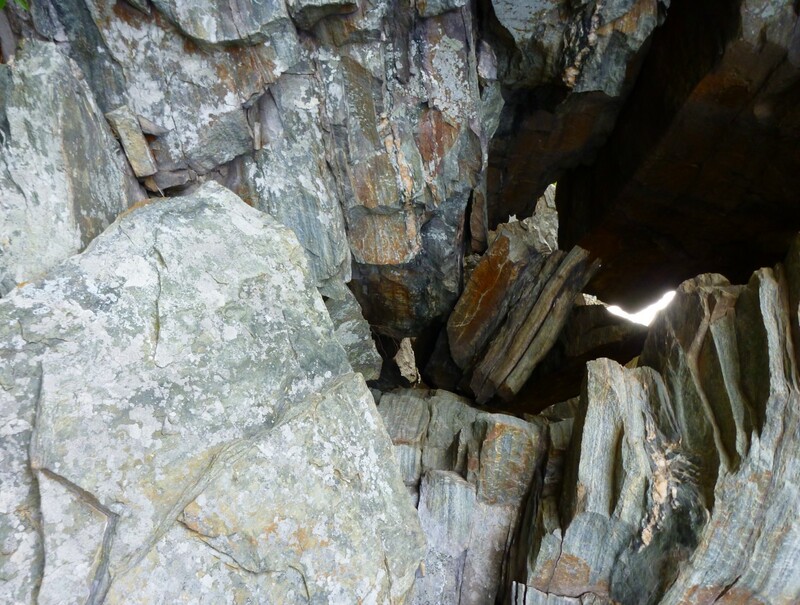 We scrambled through a crack to return to Rockjock. 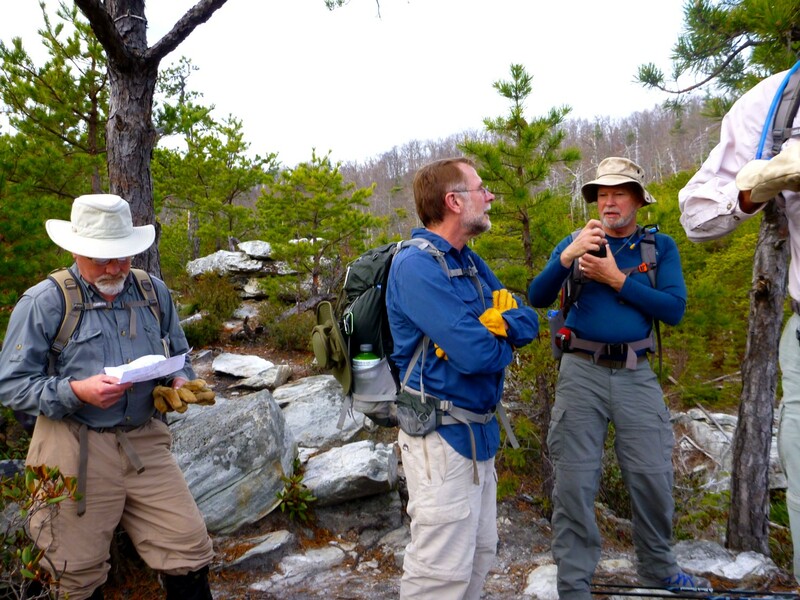 Jim studies map, Dale ponders, Gary checks GPS. We scrambled down to One Bat Cave. From around this point until past Razor Point, we were on LOST rather than the official trail. 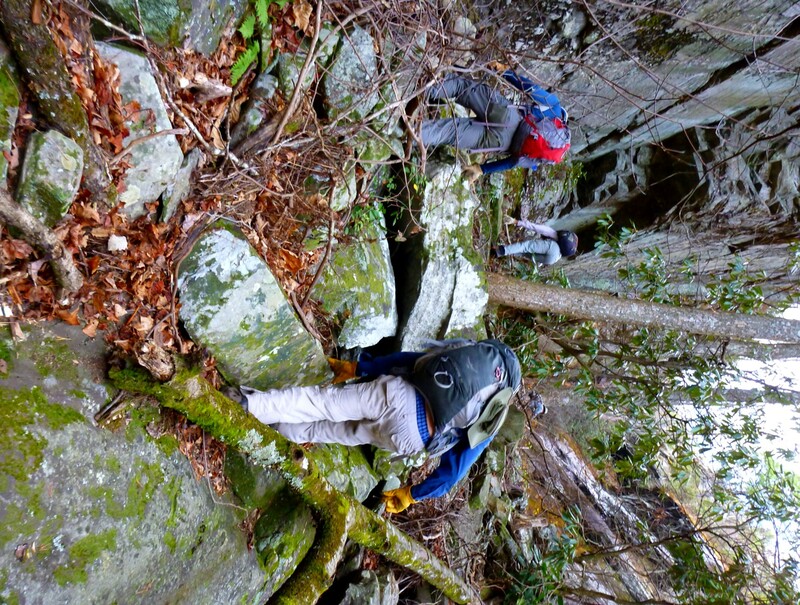 Rocky passageways, gullies, and keyholes put us through our paces. We had some interesting scrambles and visited notable points along the rim. 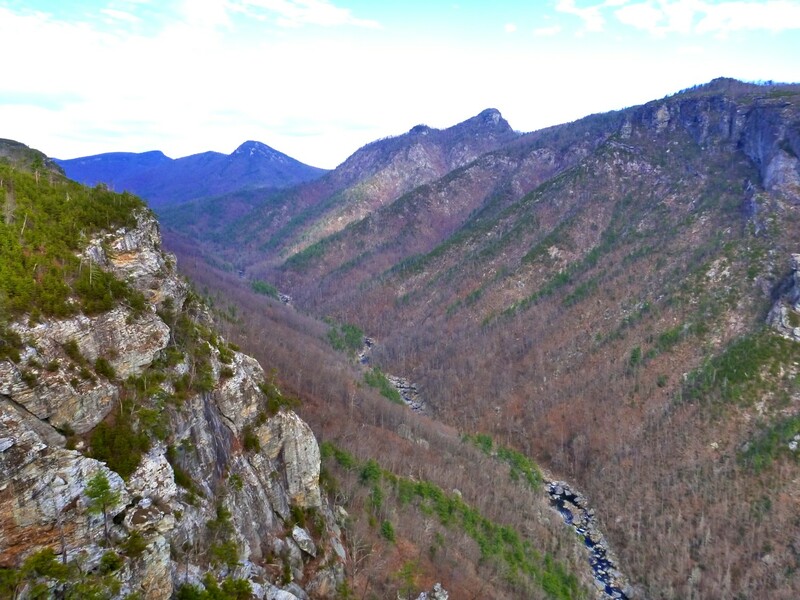 Linville River flows far below. 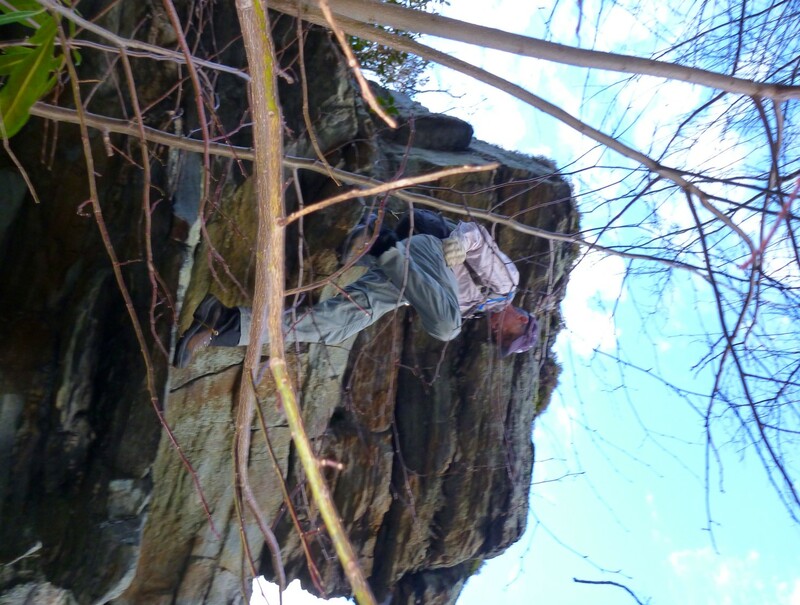 Will scrambles down a fissure. Overhang as seen from out on Little Seneca. Holly beside the path. We saw mistletoe, too! Devil’s walking stick (Aralia spinosa). 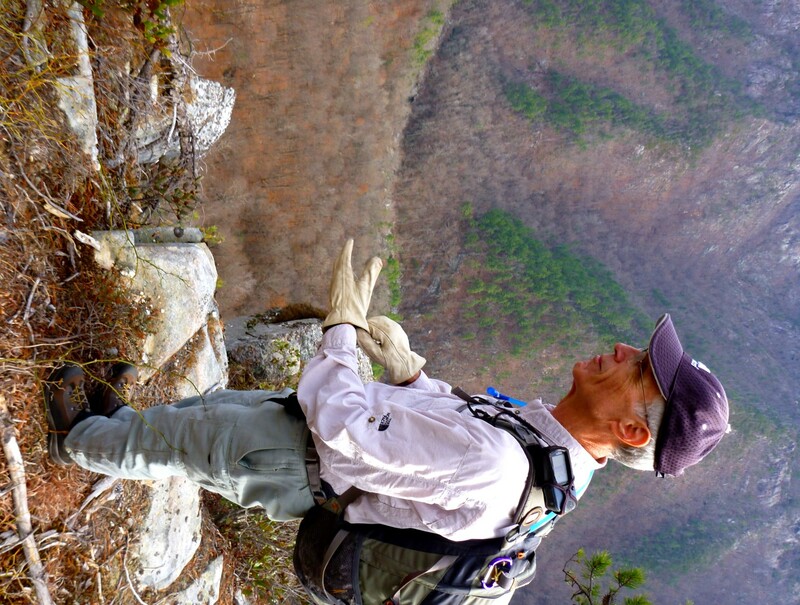 We touched Zen Point, where we had views not only into the gorge but over to Razor’s Edge Rock, our next destination. Two of the group headed out Razor’s Edge while the rest of us went to Razor Point to take pictures of our companions on the exposed rock. 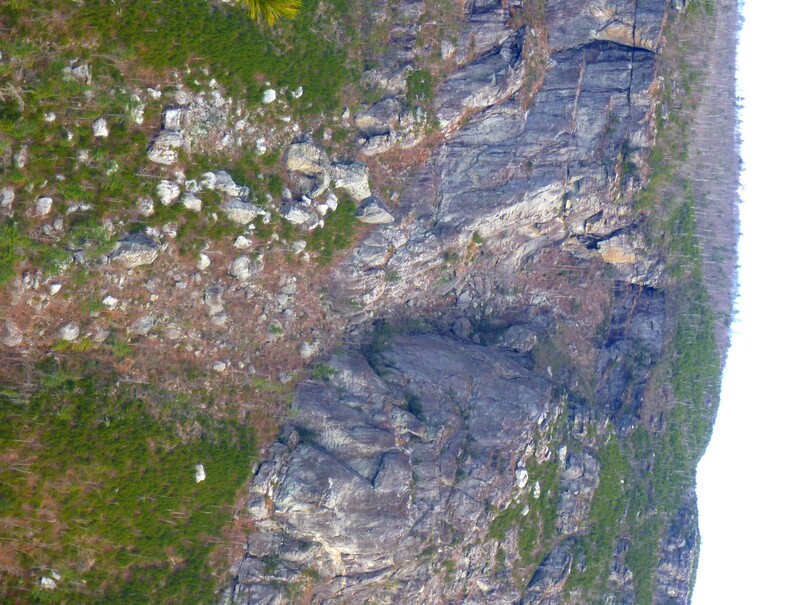 In the photo below, you see the Edge in the middle, the long fin of exposed rock. Some of us then descended to the Edge to join our friends. 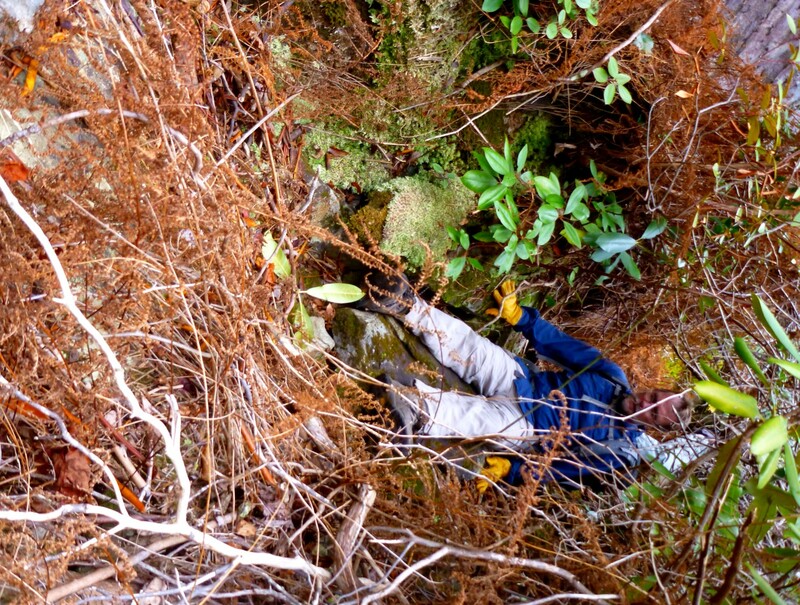 You scramble down a very steep gully and then tackle an awkward little scramble to get out on the Edge itself. Razor’s Edge in center of photo, taken from Razor Point. Out on Razor’s Edge, looking back toward the gully. I am standing on a pile of stones near the end of Razor’s Edge. The little ledge system that’s the gateway to the Edge isn’t that much of an obstacle to climb in getting out to the Edge, but it is awkward coming back down. 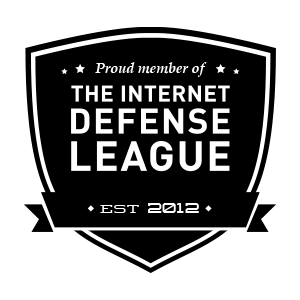 There are dropoffs on both sides. I used a handy little protrusion on the side as a foothold. 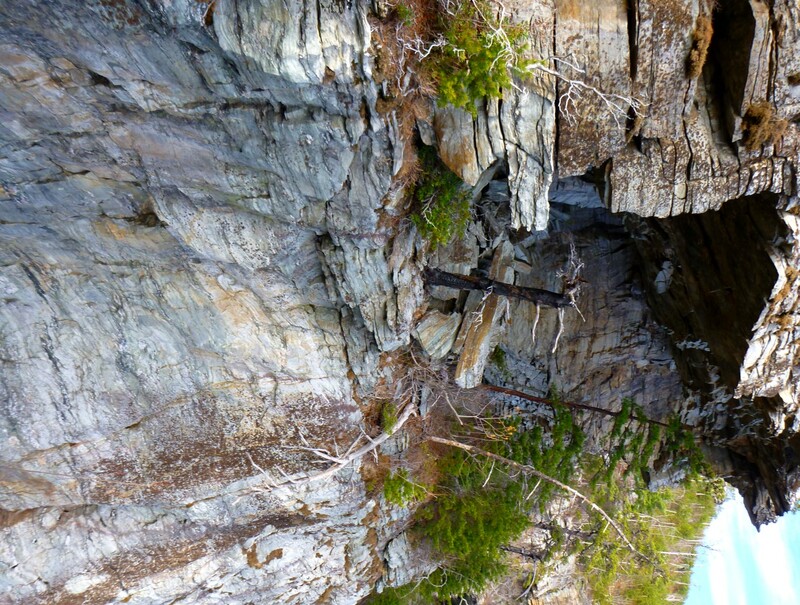 Marshall descends the “gateway” to Razor’s Edge Rock. We continued on to Sunshine Point. The gorge from Sunshine Point. Looking across to the Amphitheatre. Now we faced a steep climb of 800′ back up to the road. Rockjock hits the Kistler “highway” 0.6 miles north of the Pinch-In trailhead, so we had a short road walk at the end. My altimeter showed a cumulative elevation gain of 2390′. 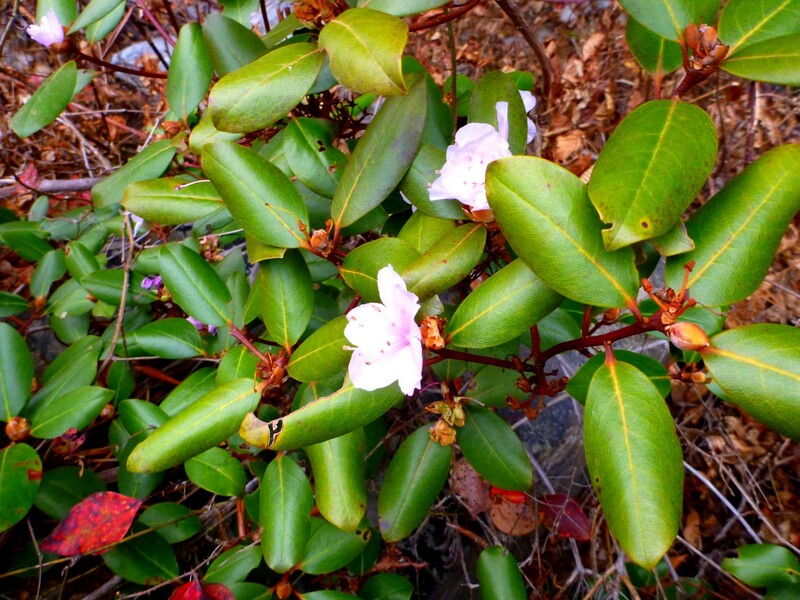 Toward the end of our outing, we saw a rhododendron in bloom—quite something for December. I’d noticed these rhodies along the way. 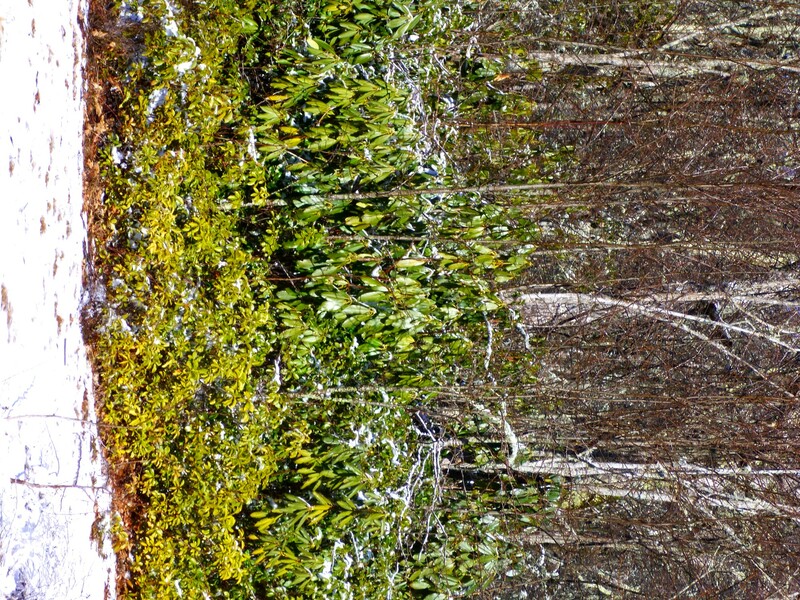 They have small leaves like the Rhododendron minus that you see in places like the gullies around the Bunion in the Smokies, but this is a very different environment, much warmer and lower in elevation. My wildflower book indicates this is sometimes called R. minus subspecies Michaux, but it is also known as Piedmont or Carolina rhododendron (R. carolinianum). I’ve been bitten by the Linville bug. I’ll be back. Carolina rhododendron in bloom in December. 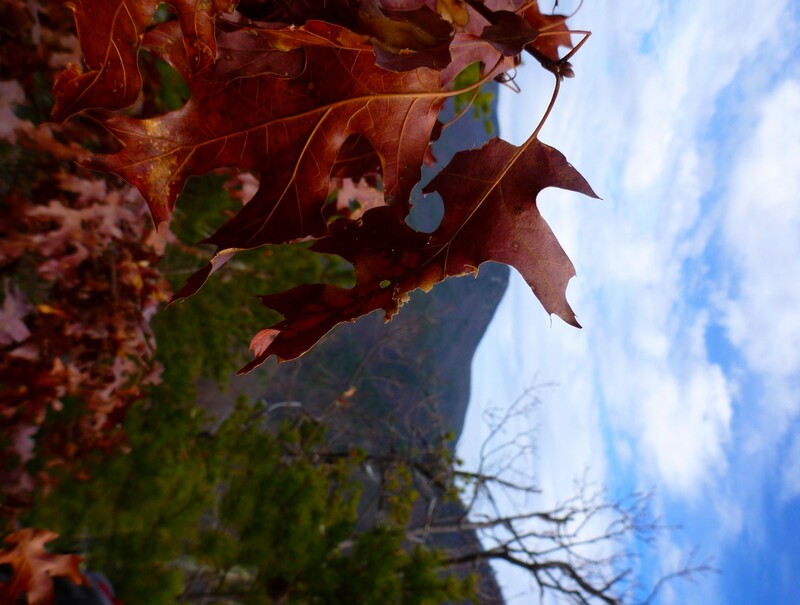 Posted by Jenny in hiking, plants, White Mountains. I took this picture along the Boott Spur trail on Mt. Washington. It was in June, at an elevation of 5000′. 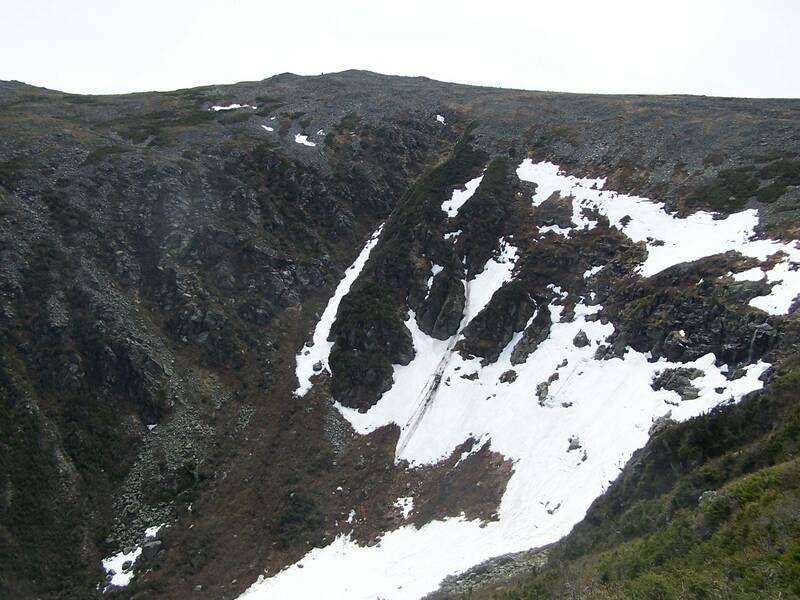 I had just connected with this trail via the Boott Spur Link, which comes straight up from the floor of Tuckerman Ravine. Once I arrived on the broad Boott Spur ridge, I began to encounter pockets of Lapland rosebay nestled in among the screefields. You notice that the leaves have a downy texture. It’s as if they need to have a little extra fur to keep warm in that harsh environment. The headwall of Tucks still had snow at that point in the season. 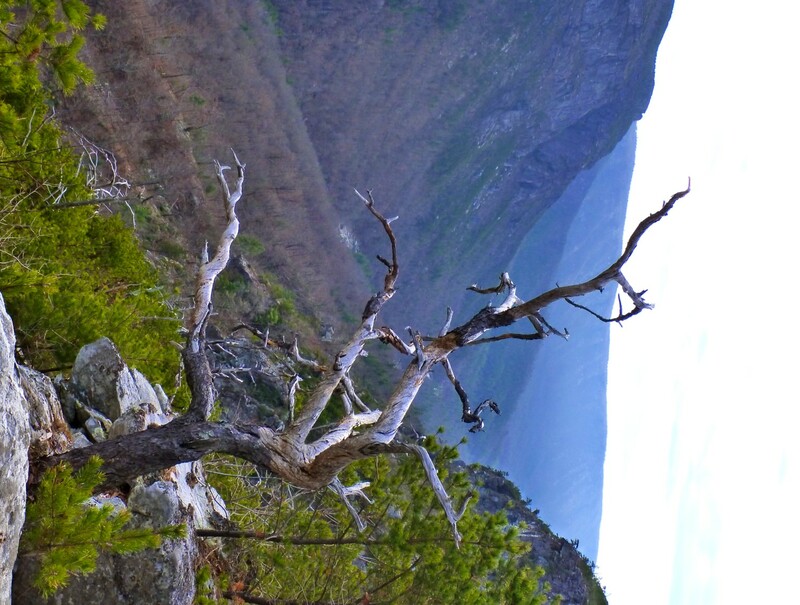 The photo below was taken on the same hike from the other side of the ravine. 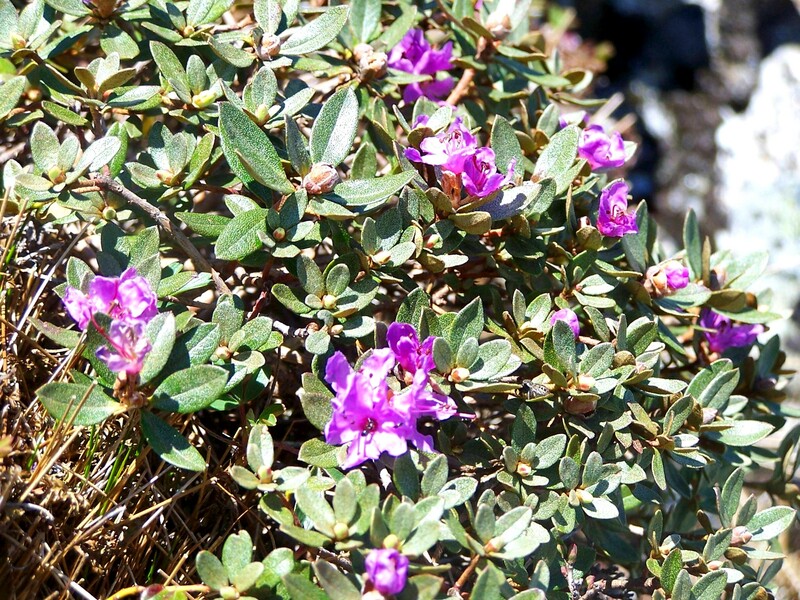 Lapland rosebay grows only in isolated alpine environments, such as around Katahdin, Washington, and Marcy. It finds pockets of soil between the sharp-edged talus rocks to grow in. And during a brief period in early summer, it comes into its glory. Those beautiful flowers, although tiny in comparison with those of Rhododendron maximum and other more familiar species, are among the largest blossoms that you find in this environment. 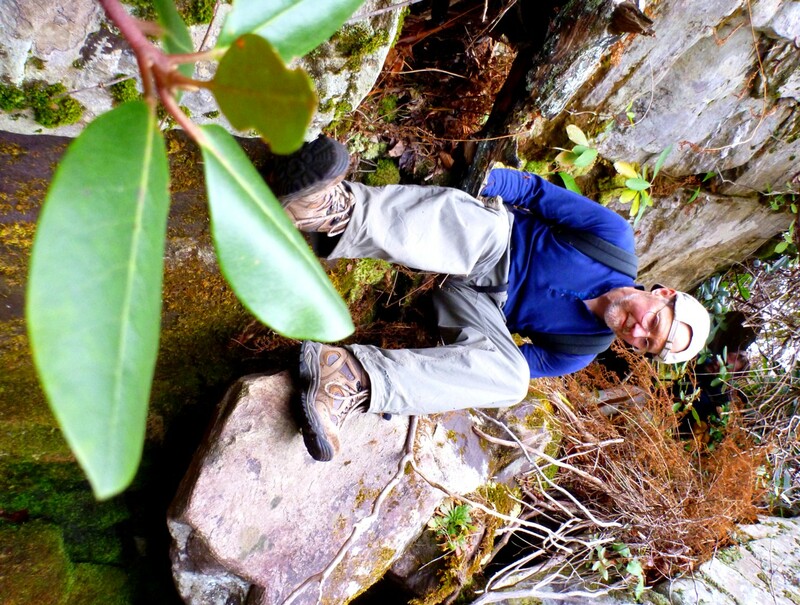 As this article explains, the “felsenmeer” is a tough place for a plant to live in. 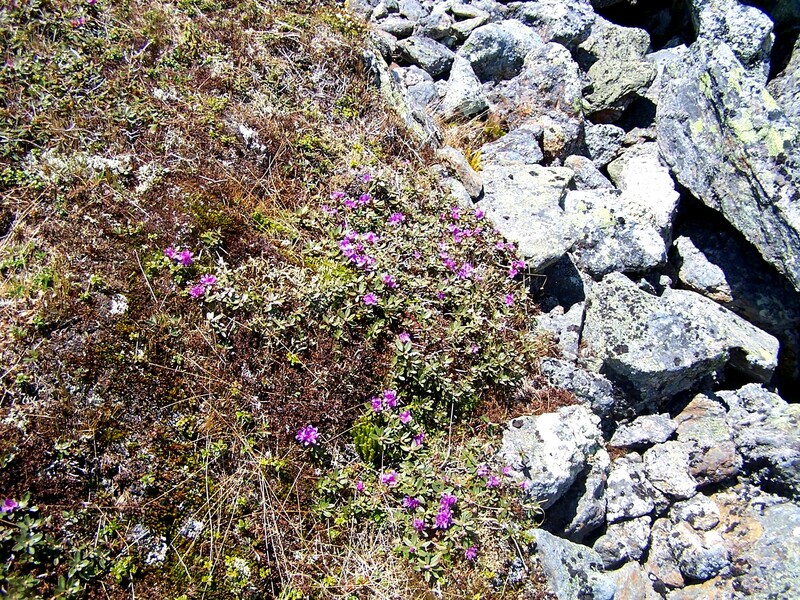 But if you look closely at the wind-blasted stone piles of this northern above-treeline environment, you start to see how plants of all kinds thrive in the crevices, the tiny seeps of high streams, the leeward sides of boulders. I can’t help but see it as a metaphor for human life amidst adverse circumstances.